This was an opportunity for us to come together as young people to discuss and chat about some Church issues and also find out what the Church teaches and why. It was very interesting to hear everyones views and understandings and have a great time doing so. The purpose was to follow up from our first gathering in the winter and also to hear some input on the Synod for Family and Marriage. We had a gathering of 30 young adults. Our format (see below) was two fold; firstly we wished to find out what our young adults THOUGHT the Churches teachings was on: Family, Divorced & subsequent remarriage & those with homosexual tendencies. This was a fruitful experience, after each groups shared on each topic we were blessed to have Fr. Ryan McAleer & Fr. Thomas McHugh explained the Churches teachings. Secondary each group discuss and shared how can our Church pastorally care more for the 3 areas. On Friday 28th November, over 50 young adults from across the diocese gathered in Newry Conference and Banqueting Centre hosted by ADYC and accompanied by Archbishop Eamon. 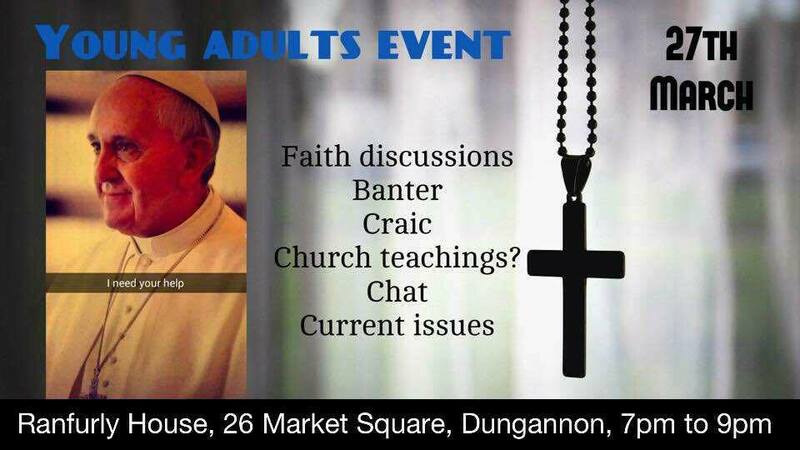 The idea was born from an ADYC meeting with Archbishop Eamon, there was discussion around the development of young adults and how the commission would gather 20 – 35 years olds to have a listening exercise. The evening was a sharing element to see what young Catholics want from their faith, and as a youth commission try to make these ideas a reality. Archbishop Eamon opened the evening sharing his vision for young adults and the importance they can play in our Church. The evening continued with a series of workshops that was designed by the youth commission to actually see the vision of the young adults and how this may be developed. The evening ended with Archbishop Eamon sharing his thoughts from the workshops. later he tweeted that he found the whole experience “Stimulating”. He encouraged all young adults that they all have a role to play and our Church needs them. There was an opportunity for the young adults to ask the Archbishop some questions they may have and we concluded together with prayer.